James Coleman at Notre Dame Basilica in Montreal. Exciting! will share them with you. O'Boyle mystery and brick wall. Patrick Coleman, Sr. His wife Katharine McDermott. John Coleman 1843-1931. His wife Mary Carraher 1841-1929. 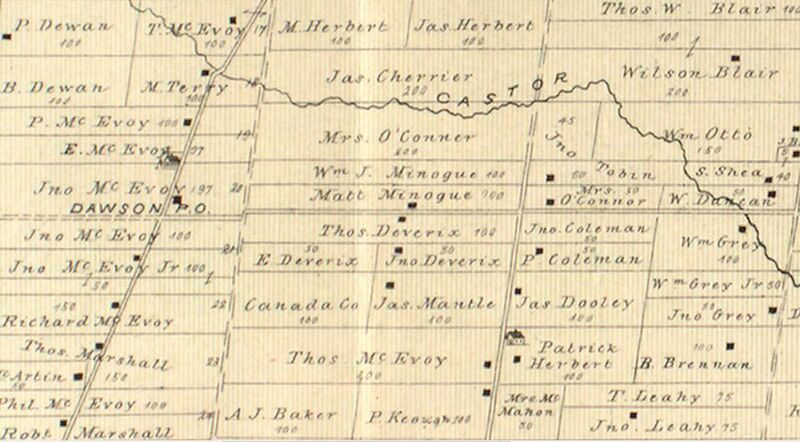 Here are two Coleman farms in 1879 in Osgoode Township. These farms are south of the village of Enniskerry in Concession 5. I was very excited to see your exchange about the Coleman family of Osgoode on the Bytown or Bust pages. were James Coleman and Mary O’Boyle. Grandparents were John Thompson Coleman and May Maude Dixon of Montreal. in finding any information about where in Ireland the Coleman’s came from through my searches on Ancestry. Society but  our research there yielded no light on what part of Ireland any of our Irish ancestors come from. We are also related to other Osgoode families through Mary O’Boyle and her mother, Julia McGregor O’Boyle O’Connor. idea until recently that my husband’s ancestors came from the Ottawa area. What a surprise and delight. if not parishes, to visit in Ireland this August. Thanks very much for your e-mail regarding the Patrick Coleman family who were pioneer settlers in Osgoode Township. I am sending a copy of this e-mail to Mr. Michael Daley who is most knowledgable about the early settlers here. (the Christopher family were my GGGrandparents). Patrick Coleman is also buried there. at building the Rideau Canal. David Coleman came from Lismore in County Waterford. He had a brother named Thomas who was still in Lismore at that time. Do these names ring any bells with you? Coleman don’t ring any bells but who knows, I am just at the beginning of my family history journey. time to search and uncover. need to take a closer look there. Hi Al, thanks so much for sending me the baptism notice. That would be Catherine and Patrick Coleman's grandson. Thank you so much for continuing to keep your eye open for the Coleman's as you research.